The Millennium Run 5K is a great race that takes place in Killen each year at 11:45 p.m. on New Year's Eve. For complete age group results, click here. For complete one-mile results, click here. Results from the Recover From the Holidays 50K, which took place Wednesday in Huntsville, are posted here. Glen King, of Athens, completed the race (a trail run) in 5:46:36. It's time to schedule your spring races! Check out the newly updated race calender (linked at right) for help as your plan for your next race. Here's wishing everyone a happy, healthy 2009 from all of us at North Alabama Runner! NOTE: Race calender is updated, finally. Matt D. & Eric P.
I think the fog makes this such a cool photo! 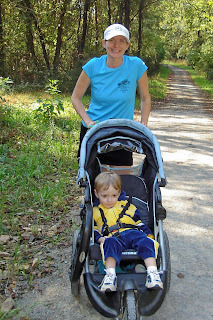 It was taken on the Swan Creek Greenway just after we had reached Hwy. 72 and turned back. 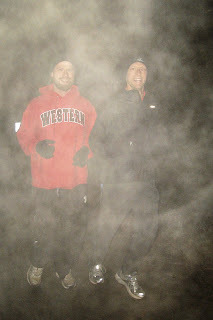 It was still quite dark out so I wasn't even aware we were running in fog until the flash captured it wafting up off the creek.